The contemporary Japanese artist, Sawako Utsumi, fuses the art world of Japan and Europe based on an array of areas. For example, from the inspiration of traditional Dutch art to the cityscapes of Paris. 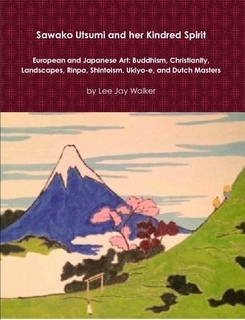 Similarly, her Japanese art focuses on angles related to Buddhism, Shintoism, and old art forms. 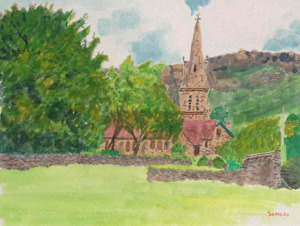 At the same time, Utsumi adores the landscapes of the High Peak area and Peak District in general; in relation to the stunning county of Derbyshire and the beautiful Christian churches that dot the landscape. However, in this article, the emphasis is on Heaton Park and the hidden gem of Blackley Forest in Manchester. 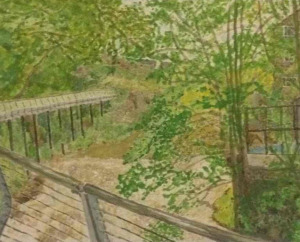 Ironically, while these two art pieces focus on the natural landscapes of Manchester, Utsumi also adores L.S. 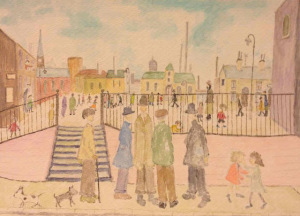 Lowry (Lowry inspired art piece below by Utsumi) with his connection to Salford and Manchester respectively. In stark contrast to L.S. 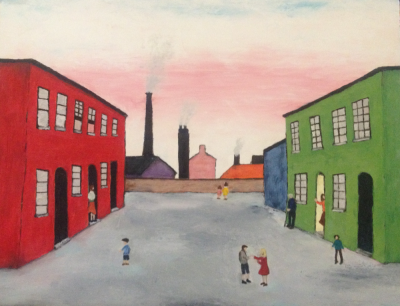 Lowry, who especially focused on scenes related to the Industrial Revolution and ordinary working-class lifestyles, Utsumi focuses on the angle of nature in relation to her landscapes of Manchester. 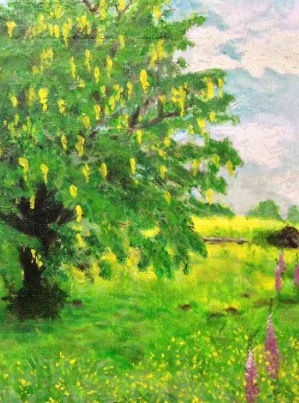 In her latest oil painting, titled the Hidden Gem of Blackley Forest in Manchester, the adorable natural landscape comes alive. 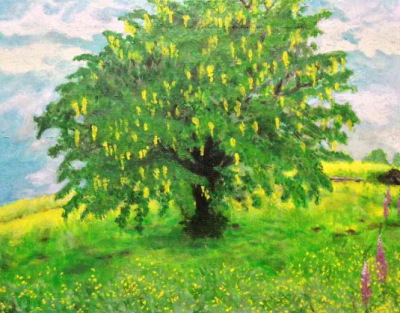 Indeed, the other art piece, titled Laburnum Tree in Splendid Isolation, is also based in the same part of north Manchester. However, despite Blackley Forest and Heaton Park sharing the same environment and being within a few minutes walking distance, it is true to say that Blackley Forest is a genuine “Hidden Gem.” After all, you rarely see many people relaxing in this less known part of Manchester despite Blackley Forest being extremely beautiful and blessed with a rich natural habitat for animals, birds, various species of trees, and plants. 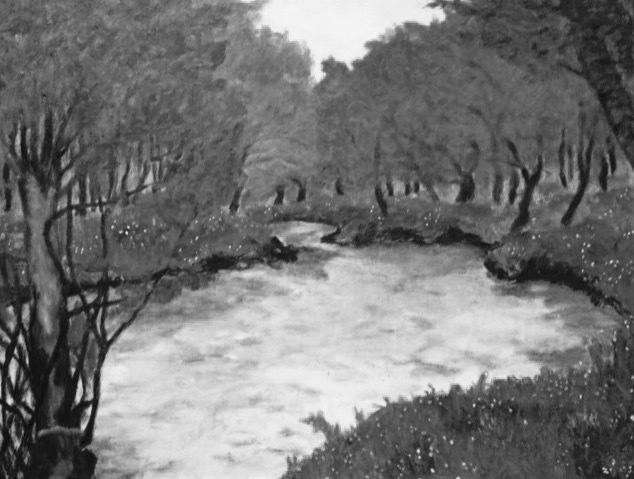 Also, Utsumi focuses on the natural beauty of the River Irk that flows into the River Irwell in central Manchester. 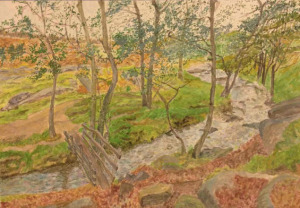 The art piece by Utsumi shows Blackley Forest in all its natural beauty. This applies to the delightful landscape and the mellow walk by the River Irk. 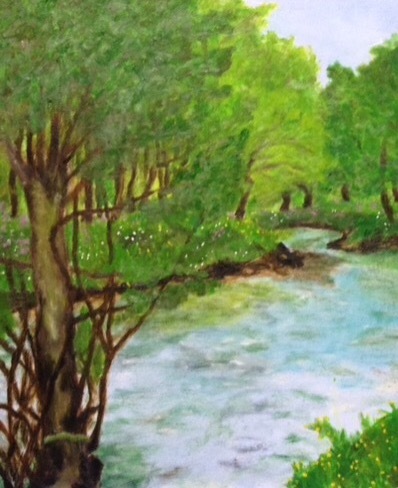 Hence, the natural flow of the River Irk blends beautifully with trees, flowers, and plants, depicted by Utsumi in her latest art piece. Overall, this contemporary Japanese artist continues to blossom because of the array of angles to her art. Therefore, her latest art piece illuminates the stunning beauty of Blackley Forest in Manchester. 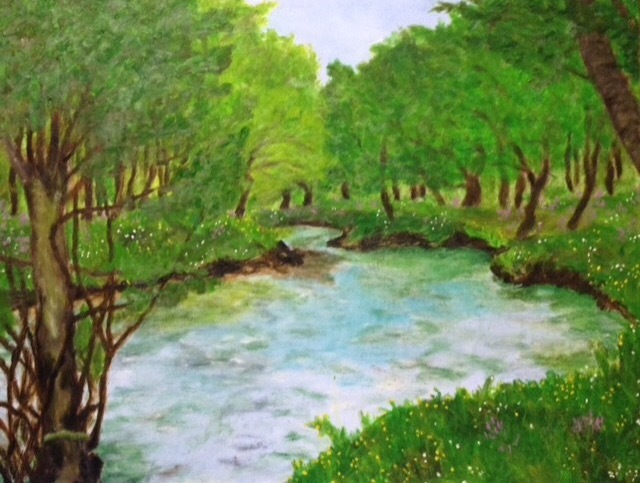 https://fineartamerica.com/profiles/sawako-utsumi.html Sawako Utsumi and where you can buy her art, postcards, bags, and other products. Also, individuals can contact her for individual requests. 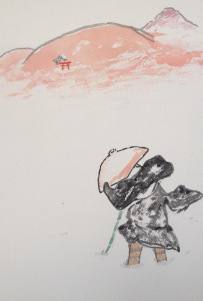 http://sawakoart.com Sawako Utsumi and articles related to her art. 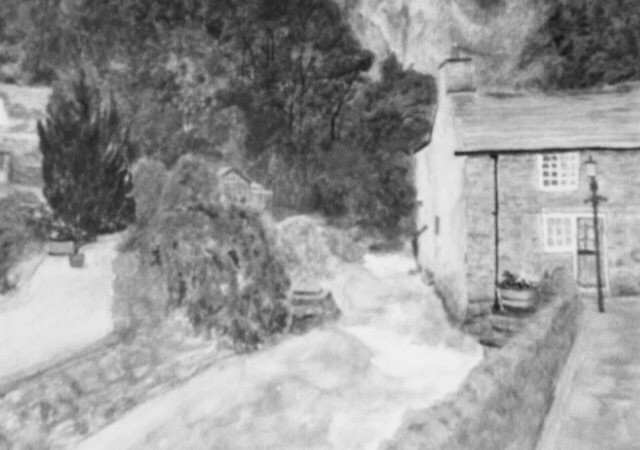 The contemporary Japanese artist, Sawako Utsumi, adores the visual reality of traditional villages and towns in the Calderdale area of West Yorkshire. 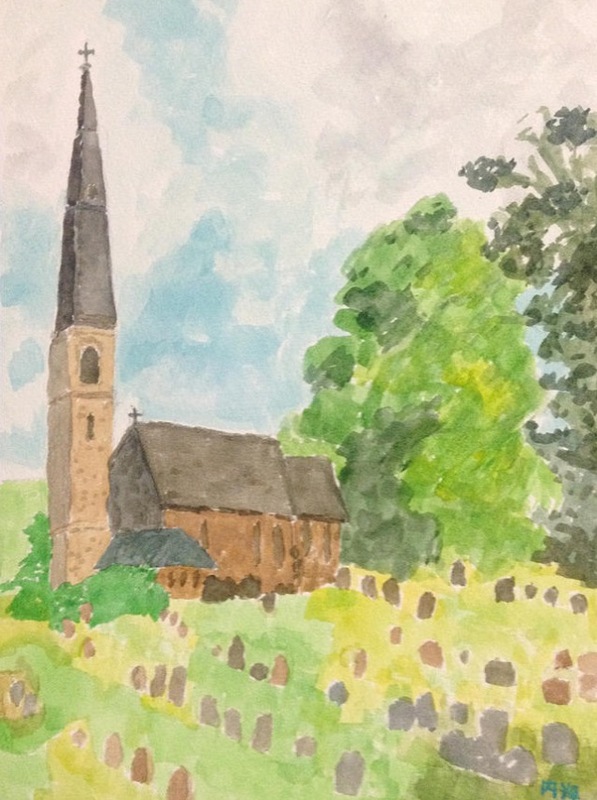 This noticeably applies to quaint old Christian churches that have survived modernity, the rugged landscape of the surrounding area, the canal area that runs through Hebden Bridge in both directions, and quaint houses that exist near the main Christian church in Heptonstall. Equally dramatic is the changeable weather and diversity of thought patterns that runs through Heptonstall and Hebden Bridge respectively. Indeed, one minute you can be walking in lowland areas of Hebden Bridge, then suddenly high up with the Pennine Way in easy reach. Or, alternatively, walking uphill to the delightful village of Heptonstall. On top of this, Hardcastle Crags and the Rochdale Canal are a treat to people who cherish the outdoors. 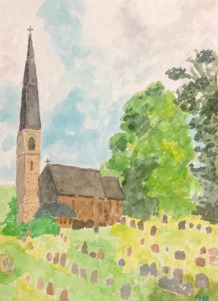 In the art piece by Utsumi titled Heptonstall Christian Church in West Yorkshire, the artist focuses on a more clear vision. 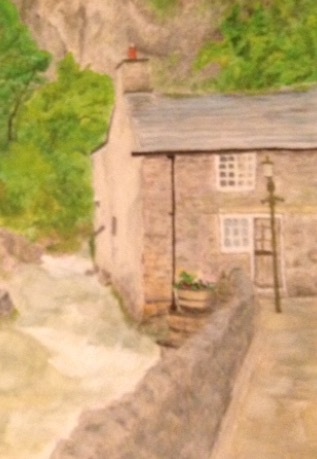 This contrasts noticeably with the more blurred art piece titled Heptonstall in Silence. Reasons behind this are multiple but with one noticeable concept behind this. 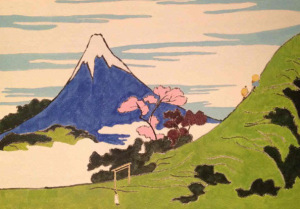 In other words, the older art piece by Utsumi resembles the mystery of Shintoism compared with the later art piece. 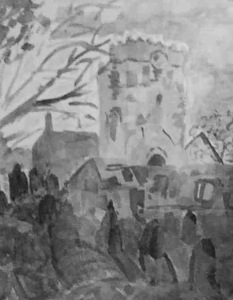 Therefore, the blurred dimensions of Shintoism and nature fuse within the troubled history of Heptonstall despite the continuity of Christianity in this part of West Yorkshire. The troubled history applies to a battle that took place in 1643 during the English Civil War. Similarly, David Hartley, alias the King of the Cragg Vale Coiners, was buried in Heptonstall after being hanged in York in 1770. 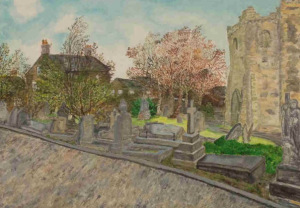 This reality means that the blurred and intriguing painting of Heptonstall in Silence is fused with the mysteries of Shintoism – that remains outside the knowledge of most non-Japanese people. 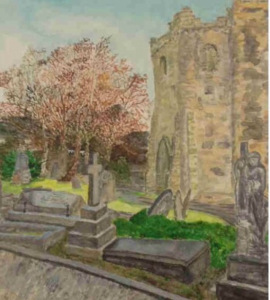 However, Heptonstall Christian Church in West Yorkshire resembles the influence of Buddhism in Japan and the familiarity of this faith internationally. Therefore, the clarity of the second art piece is based on familiarity and the right path, compared with the power of nature that burnt brightly in the soul of the poet Ted Hughes who hails from Calderdale. Ultimately, the Crow may have been Ted Hughes himself, compared with the mammal Sylvia Plath who is buried in Heptonstall. These fusions of ideas, and intricacies, equally enter the mindset of indigenous Shintoism. Yet, this applies to different angles because the Crow was Buddhism during the Edo Period that often devoured Shintoism. This reality persists in areas of high culture and political significance despite the changing winds of the Meiji era. 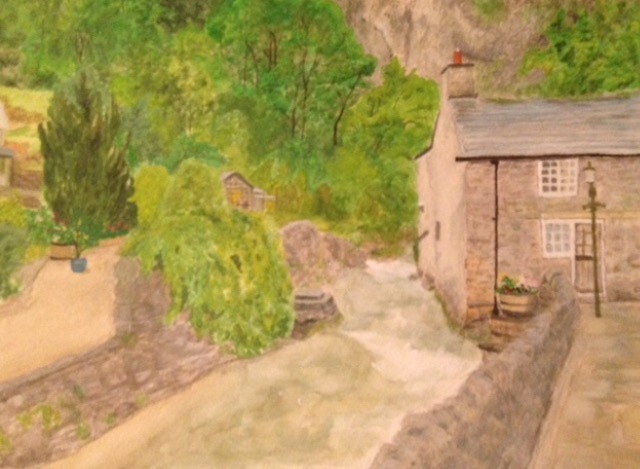 Overall, Utsumi is not only focused on the delightful setting of Heptonstall because this contemporary Japanese artist is trying to fuse this within her native land. Yet, unlike the sinister world of humanity and nature that awaits the Crow by Ted Hughes, in the world of Shinto nature is comforting and powerful. Equally important, it connects with the soul and ancestors. 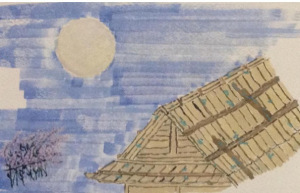 Therefore, Sylvia Plath may be buried far away from her native home but in the world of Shinto, her spirit is like a kami that awaits a new beginning – or, in the Christian trinity, a mystery remains where the Crow is defeated by the Lamb. L.S. 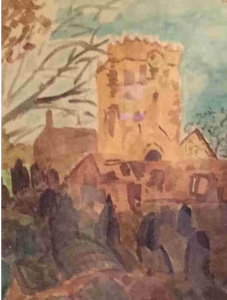 Lowry (1887-1976) and Sawako Utsumi come from two very different cultures that have been shaped by the respective faiths of Buddhism, Christianity and Shintoism. Of course, in modern day Japan and the United Kingdom then secularism is altering the religious landscape. At the same time, new faiths in the United Kingdom representing Hinduism, Islam and Sikhism are especially impacting in major cities. 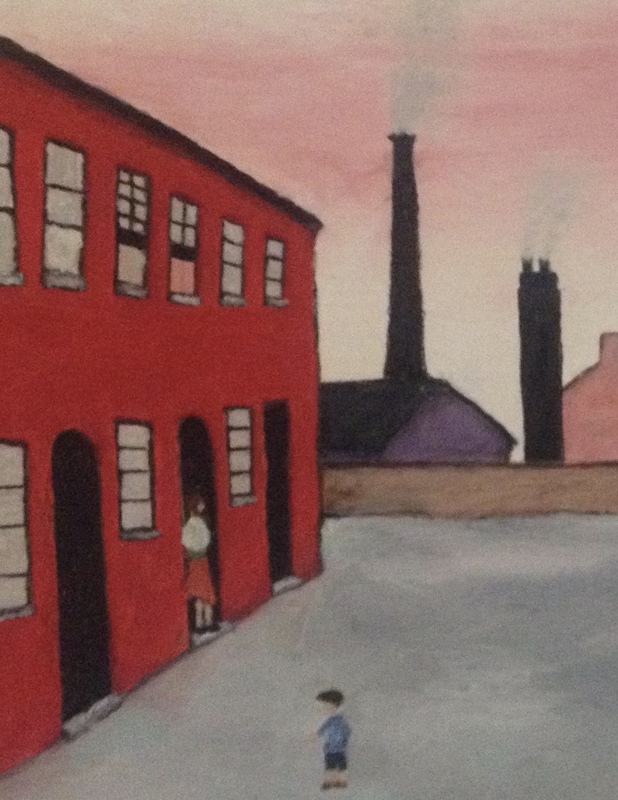 Likewise, the legacy and the reality of the Industrial Revolution was especially potent for Lowry whereas for Utsumi, a contemporary artist from modern Japan, then her reality is shaped by the countryside of the Sendai region to the neon lights of Tokyo. 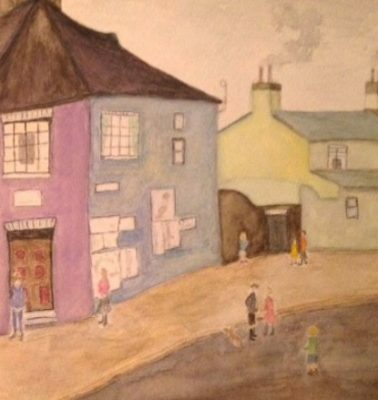 Lowry during his artistic informative years still wasn’t sure about the direction he was going in. 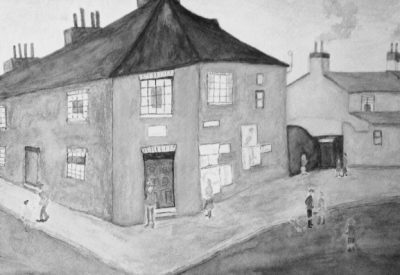 However, just like the chaos of life, one day a new reality dawned on Lowry whereby he would firmly focus on what inspired him. In saying this, Lowry is much more diverse than most people appear to realize. However, clearly his legacy belongs to urban and industrial themes dotted by individual forms of people. 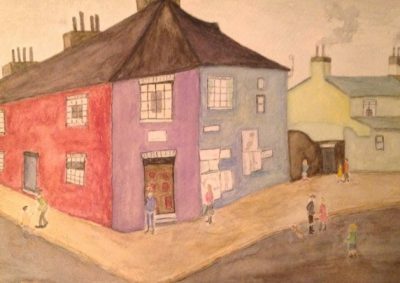 Utsumi, coming from a very different culture and environment – and being born in the mid-1970s – brings a new light to the darkness and natural beauty of Lowry. 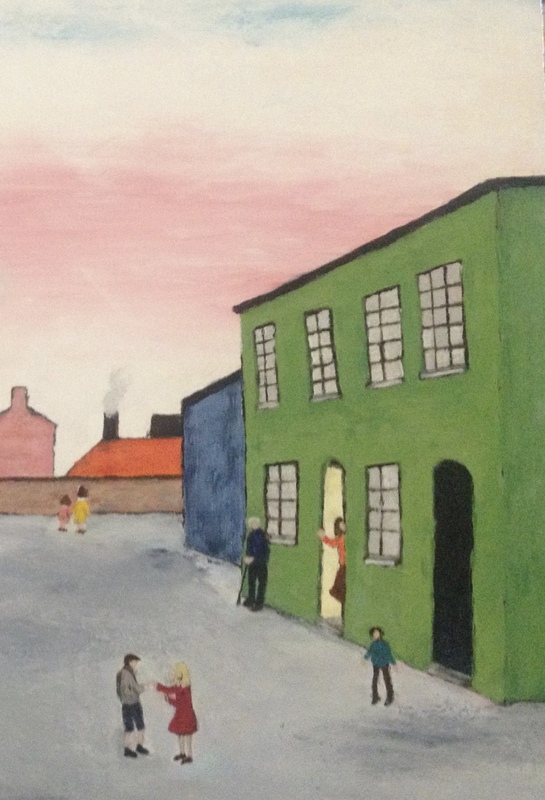 In Utsumi’s two art pieces in this article (painting 2-4), whereby she is paying homage to the rich legacy of Lowry, Utsumi brings the light of her grandparents (now passed away but remaining strongly within her heart) and the environment she knows. 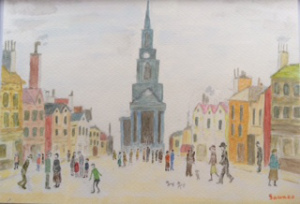 The contrast from the originals by Lowry – to the creativity of Utsumi – creates a natural state of mind that highlights the difference in time and perspectives. 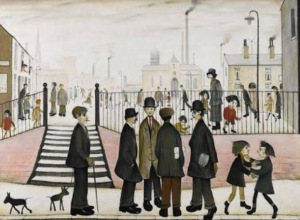 In the world of Lowry you had hard working people battling against the reality of industrialization, pollution and poverty. However, for Utsumi, while acknowledging that poverty still persists in modern Japan and the United Kingdom, the neon lights of Tokyo to the comforting rural areas of the Sendai region provides hope. Overall, the different angles shine magically because Utsumi prefers to focus on her own reality of Lowry. This applies to an inner beauty that isn’t masked by the themes and darkness of certain art pieces by Lowry. 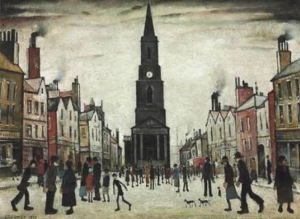 Therefore, the spark that Lowry created is extremely important to this modern Japanese artist who hails from Sendai. 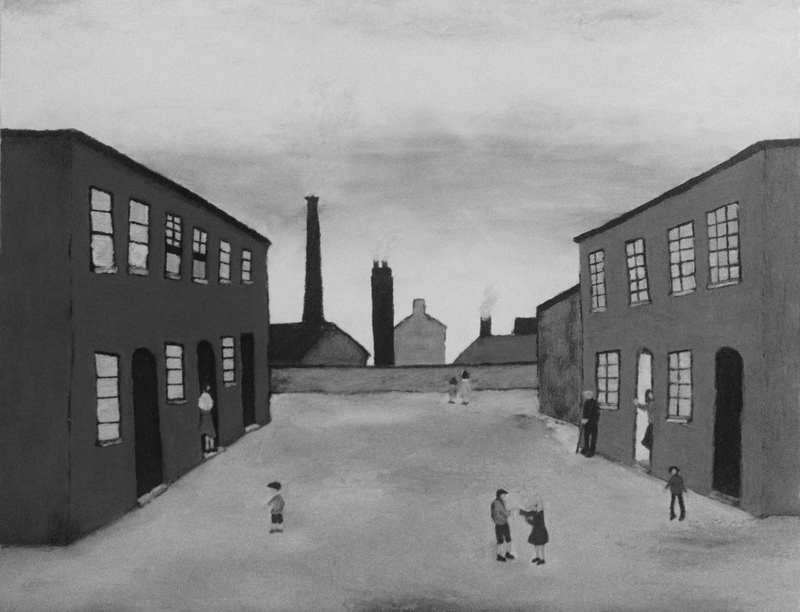 Given this reality, Utsumi is paying homage to Lowry based on different thought patterns and periods of history. The end result is extremely uplifting because the power of the originals by Lowry will always remain potent, while the lightness of Utsumi illuminates her own personal creativity while not distracting from the richness of Lowry.